Billy Beane turned down $12.5 freaking million annual salary from Boston Red Sox! I sure hope he get some royalty out of this movie. I have to leave early before the movie ends the first time around. I drew a conclusion on my own after that thinking Billy Beane probably took the job with Boston Red Sox and hence, the 2004 World Series win breaking the 86-year curse. I finally was able to catch the ending which disappointed me to the core. He turned down the huge (I mean, life-shattering-huge) salaried job and stayed with the Oakland A’s. I am not a super fan of any sport but I did enjoy movies about sport. Moneyball is not just a movie about baseball but it was about solving problems against all odds, being brave to fight to make a change for something better you believe in and determination to do whatever it takes to make it happen. 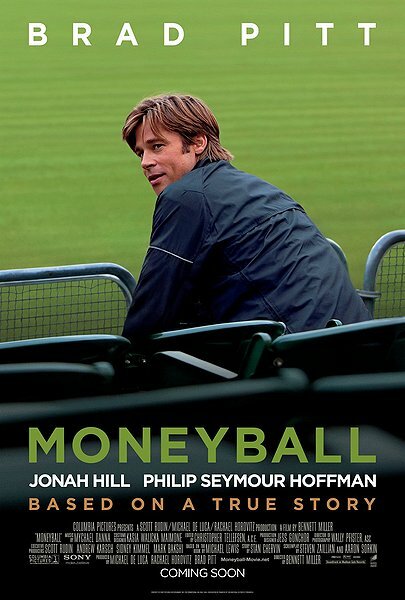 That takes Moneyball into a whole entire level. The scene where Brad Pitt traded out players whom Philip Seymour Hoffman anchored for first base got a laugh out of me to prove his point. I absolutely in love with the soundtrack especially “The Show” originally by Lenka. I wasn’t able to get that song out of my head. The song was performed by Billy Beane’s daughter played by Kerris Dorsey with a twist on the lyrics adding “You are such a loser dad”. It was a perfect fit for the irony of the movie ending. Last time I checked, this movie scored 90+ on both regular viewers and critics on Rotten Tomatoes and I agreed.